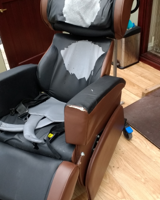 Do you have a chair that you currently cannot use due to broken castor, ripped or dirty upholstery or a motor mechanism that no longer works? Bring it back to life at a fraction of the price of buying a new replacement. 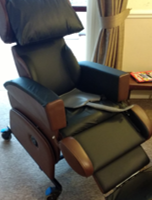 A fast and efficient service to repair or refurbish your existing posture, nursing and raiser/recliner chairs. We use a range of parts, both new and refurbished, soured directly from the chair manufactures or local suppliers, to meet your budgetary needs. We can give you a free, no obligation quote to get your chair back in service. We currently carry out this work for the NHS, Social Services, residential care and nursing homes, supported living services and individual clients and their families. Removal and environmentally responsible disposal and recycling of unwanted chairs. We are suppliers for the leading UK chair manufactures and our work is guaranteed.